Whether you want to build your brand online, boost visibility online or want to improve damaged brand due to negative results in the search engines. 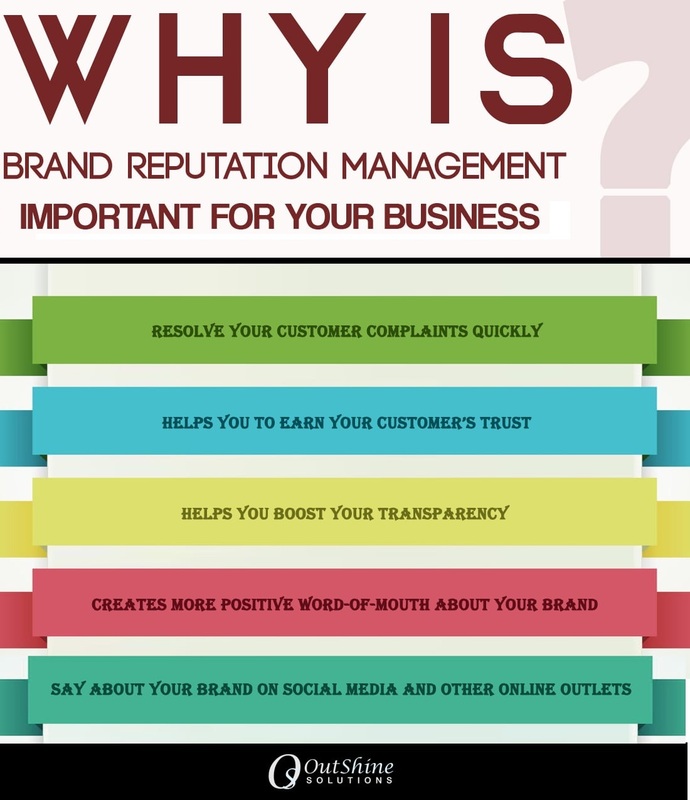 Outshine Solution’s brand reputation management services can help you clean up your reputation online. We protect your brand image from harms and helps you avoid many other issues. We cover the complete range of online reputation management, raising your authority and getting you trust with search engines and customers. So, let our professionals help you to craft your online brand reputation, just the way you want it. Do you know about 85% of customers look for online reviews and about 55% of these potential customers will change their mind about a product or service if they read negative reviews online? So, bad or negative reviews can have a hugely damaging impact on your brand, leads, and sales. We understand this and can push negative publicity away from the search results and far away from the eyes of your target audience. This provides your business the best possible chance at improving its reputation, leads and finally sales. We constantly monitor your brand mentions across all search engines and social media channels. We work with all kinds of businesses and our team is experienced and have delivered exceptional results for brands (small and big both), corporates, celebrities, hotels, hospitals, restaurants, and individuals. Why not let us do the same for you? Social Profiles: On your behalf, we create social media profile on Facebook, Twitter, LinkedIn and other brand-based social media sites to drive up your site in the search results. Brand Monitoring: We do research on how your brand is perceived online, and identify new opportunities for promotion. Blog/News Posts: Our professional team of writers will create unique and original content for you and then submit to effective PR and blog sites that will keep your site fresh and ranking good. Review Generation: We reach out to customers and partners add encourage them to share their positive experiences. Multimedia Platforms: Our experts work with you to produce interesting and captivating videos and load them on YouTube and other video sharing sites. Link Building: Our team of experts will be creating a positive impression on customers by generating high-quality links from relevant website to your sites. Local Visibility: We ensure that your brick-and-mortar business is well-positioned to look in local search and map listings. We, at outshine solution consistently work towards keeping your brand identity and ethos in mind when planning our incorporated marketing campaigns. Our campaigns are tested to make sure we are promoting the correct message online. We want to be your partner, not only a vendor.